The spring tour starts tonight! 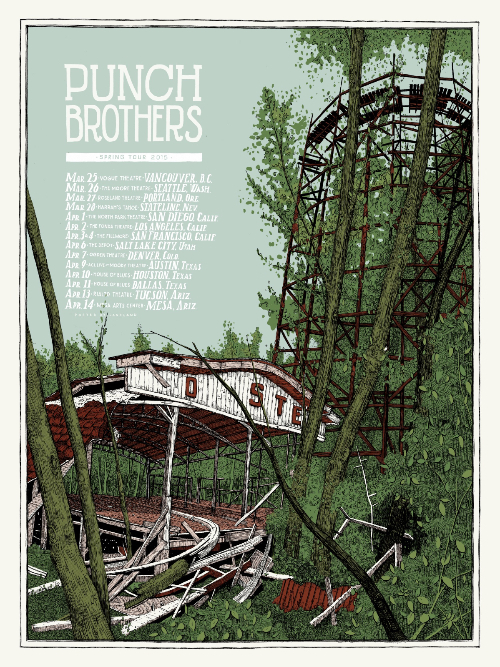 Our friends at Landland designed another limited-edition tour poster for us to sell during this run at the merch table. We've scheduled a short return trip to the UK at Royal Festival Hall in London on August 1st and Cambridge Folk Festival on the 2nd. We've also been added to the lineup for Milwaukee's Summerfest on June 26 and most of our new US dates with Béla Fleck and Abigail Washburn this July are on sale now. You can find all those details on the tour page. In other touring news, Critter and Julian Lage are getting the band back together. Over the next few months they'll be touring east of the Mississippi (plus St. Louis), with a couple of dates in California for good measure. You can pick up a copy of their new-ish album Avalon here or out on the road. Noam and Stuart Duncan will be playing the world famous Station Inn in Nashville on May 8 as they gear up for their West Coast run together in June. If you missed it on our Facebook and Twitter, the boys made a visit to NPR Music's Tiny Desk and CBS This Morning for a Saturday Session.